Rhema Teacher Training mainly consists of online videos that are broken down into six different modules. Each module is purchased separately and available for a three-month period – allowing you to study at your own pace. A top priority at Rhema Yoga is to teach others how to practice our system of yoga so that they can then teach others as well. We want to share Rhema around the world! Upon completion of the following 100-hour course requirements, students will be presented with a Certificate of Completion "R-RYT100" which stands for "Registered Rhema Yoga Teacher, 100 hours"
The R-RYT indicates completion of the following Rhema Yoga training. 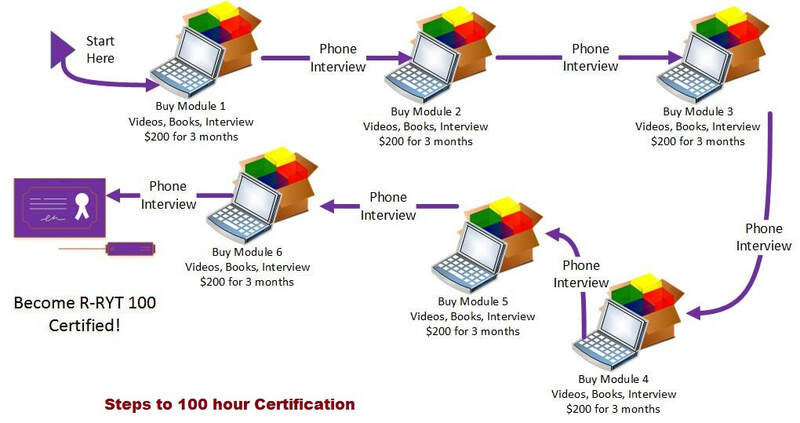 Many students, even if they have never taught or become certified at another school, can take the R-RYT 100 certification and begin teaching right away. This is a personal choice and depends on how much you are able to obtain in the lessons and how confident you feel in your ability after the training. If you have taught yoga before and/or already have a yoga teaching certification from another school, the R-RYT 100 certification may be all you need to learn and teach Rhema Yoga. ​So What's the R-RYT 200? The 200 hour certification is for anyone who has completed their R-RYT100 and is eager to learn more, grow more, and develop their practice or teaching career more. Students retreat on a 4-day journey into the woods in the peaceful region of Upstate New York, where they study, practice yoga teaching (including leading classes, giving assists/adjustments) and more. This is a time of both reaching out and developing a great community of like-minded Rhema Yoga Yogis. It is also a time of inner reflection and rest in the "secret place" with God. People who take the R-RYT 200 usually teach, but anyone wanting to deepen their relationship with God and develop community is encouraged to look into this amazing retreat. Below are some of the topics that we cover in our 100 hours of training. This list is not extensive, so please do contact us if you have any questions or would like to know more information. We're happy to help! ​At it's core, Rhema Yoga is not a studio or school, it is a system of presence-based Christian yoga. ​We are training people just like you how to teach Rhema Yoga so that you can either start or improve your own studios and school and begin to teach on your own! We win when we equip you to teach others Rhema Yoga on your own, at your studio, home, church or even the park!